Valentine's Day: White Chocolate Raspberry Cheesecake - E. Armata Inc. Looking for a tasty treat to add to your Valentine’s day menu? Well, we’ve got you covered. 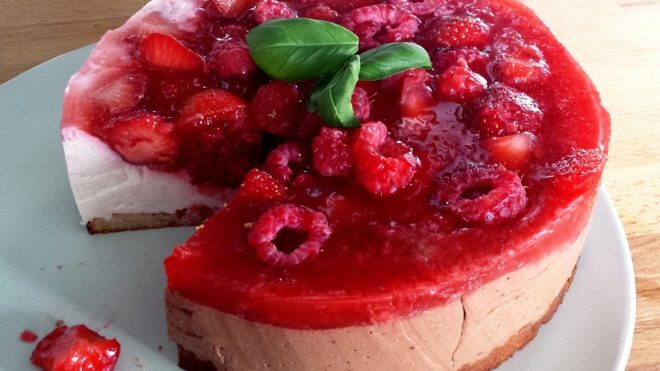 Try making this white chocolate raspberry cheesecake recipe. Follow the steps below for everything you need to add this tasty treat to your Valentines day. So now that you’ve got all the ingredients, here’s step by step directions on how to make it. After mixing all these together, press the results into the bottom of your 9-inch springform pan. Once you’ve got it all, bring it all to a boil and continue boiling for about five minutes until the sauce thickens. Once it’s thick enough, you’ll strain the sauce through a mesh strainer this way you won’t have any lingering seeds in the sauce. While you have the oven preheating at 325 degrees, grab a metal bowl and melt the white chocolate chips with the half-and-half over a pan of simmering water. Make sure the mixture is completely smooth before you stop. Next, you’ll pour half of the batter over crust. Then you’ll start spreading 3 tablespoons of raspberry sauce over the batter. Take the remaining cheesecake batter you have and pour it into a pan. You’ll then spread another 3 tablespoons of raspberry sauce over the batter in the pan. To create a marbled effect, you can then swirl the batter with the tip of a knife. Lastly, you’re going to bake the cake for 55 to 60 minutes. Make sure the filling is set when you take it out. You’re then going to cool the cake by covering it with plastic wrap and placing it into the refrigerator for about eight hours. Once you’re ready to serve it, you can add the remaining raspberry sauce.